Full moon was out once again and the conditions and timing were perfect to head out do another full moon night shot. Shot at 250 iso, next time I’ll put the 5D mk2 on 50 iso and add the extra 2 and 1/3 stops to the shutter speed and see how it does with noise. As I have seen and heard of some good reports and seeing it is winter and the camera will be at it’s coldest might also help reduce noise. Might so I have read anyway as the sensor wont heat up as much causing noise. !! Click the image to see the larger view. 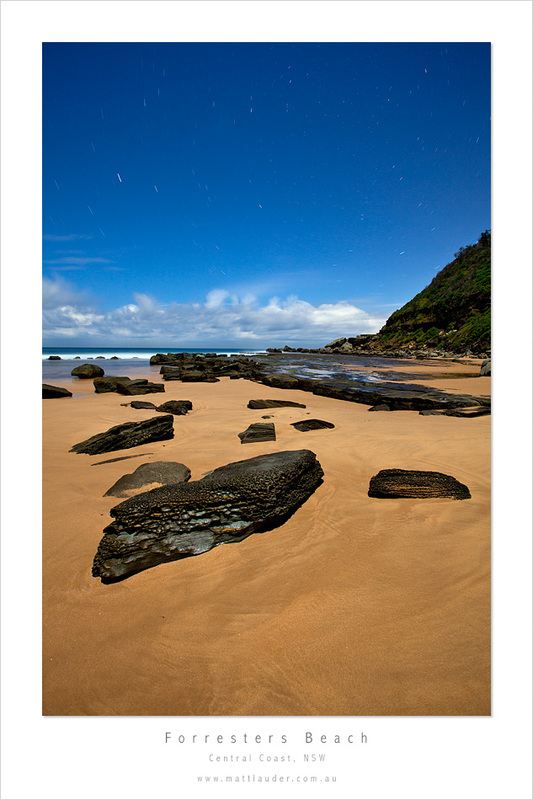 This entry was posted in Uncategorized and tagged Forresters Beach, night photography, star trails. Bookmark the permalink. im not sure if this is right, but if you take a test shot at high iso, like 3200 or whatever, can you then divide that shutter speed by the iso (eg 32/ or maybe its 3200) and that will give you the right shutter speed to shoot the image at a low iso, like 100 or 50? The same goes for changing the aperture by one stop, so lets say 320 sec. isn’t enough, close the aperture down to f/11 (one stop darker than f/8) and you can double the time again to 640 sec. The way I usually test is to shoot at f/2.8 (or wider depending on the lens) at a high-ish ISO for my test shot and then I start closing the aperture until I get to something with a bit more DOF, then I start dropping the ISO, while I’m doing this I just keep doubling the shutter speed in my head until I hit the exposure time I want. Woa! it looks cool,the stones looks like jade sitting on soft, tender yellow sand river.I like it. Nice image, I’m amazed at the images I’ve been taking in museums without a flash. The 5D Mk2 leaves my old 40D for dead. 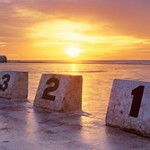 PS: Are you still in the market to offload a 17-40mm L Series Lens? Nice one Matt, surreal colours. Brilliant work here Matt – the blues that you have got out of that sky are incredible! Looks great Matt! I’ve never really tried to get a ‘daylight’ looking shot at night, yours turned out really good! I wouldn’t bother about ISO50, because you loose a bit of dynamic range to the simulated low ISO mode. You’re brave heading up to the 7 minute mark on this one, I tend to draw the line at around 8 minutes on the 5D2 for dark images, but I imagine you could probably push that to the 10-12 minute range with a brighter more detailed image like this.